Aubren watching the clock strike. Although the move has gone smoothly, we’re still adjusting to a new home and can’t seem to find anything when we need it. Or it’s still at the old house! One little thing has made quite a difference. In 2002, our youngest daughter bought an “antique grandfather clock” from England that was a limited edition clock to celebrate the Golden Jubilee of Queen Elizabeth II. The clock bears a commemorative plate on the front. Of course, it’s not really an antique as it’s only 14 years old, but it looks like an antique. Finally, we have a good place for it and it’s now chiming every 15 minutes from 7am to 10pm. Our eldest grandson loves it. Wherever he is in his “new house” he runs to the clock when it starts chiming and is fascinated by it. 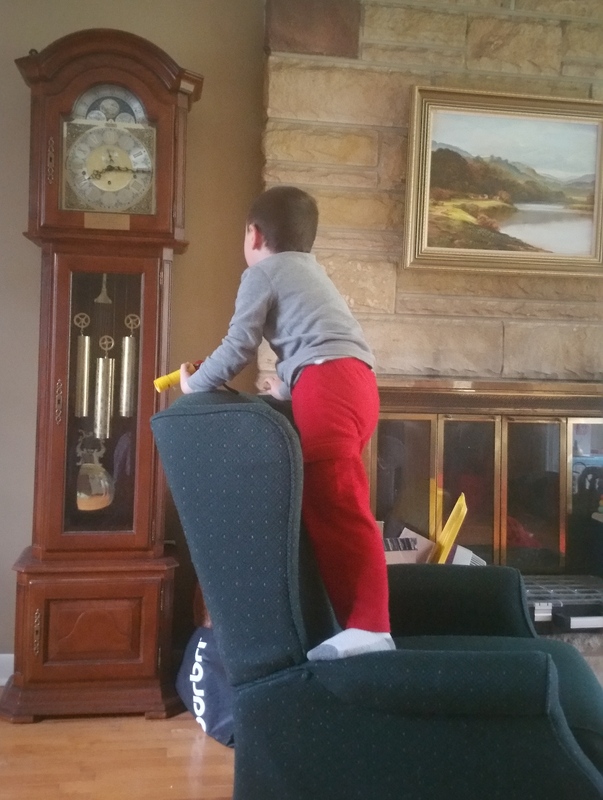 He then comes running back to me pointing in the direction of the clock and repeating enthusiastically “Hickory Dickory Dock.” (Long-time readers will remember his love of the old nursery rhyme.) I’m taking the opportunity to teach him time using the clock. Every hour you hear the number of strokes denoting the passage of time. The chimes are “Westminster” chimes, just like Big Ben. Although, to be exact, not like Big Ben, which, after 150 years, has now been silenced for extensive repairs. I don’t know what the BBC will do. When we lived in Ghana, we heard the chimes of Big Ben every day on the BBC World Service, the most listened to radio service in the world. In a period of turmoil, it conveyed a sense of stability, normalcy and even sanity. But it’s now too old to continue – until it’s fully repaired. Our clock and London’s famous clock are reminders of the passage of time. No two days are exactly alike in this world. Every fifteen minutes, there’s likely to be some change. I wonder what the world of our grandchildren will be like when they are 65? This year we are seeing some changes that may turn out to be very significant. On Sunday, Austrians gave the right-wing Freedom Party the most votes in the first round of the Austrian presidential election. Now, the president of Austria does not have executive powers. His responsibilities are more ceremonial, similar to what the Queen has in the United Kingdom. However, he can dissolve parliament and call an election. If he does, we may find his party wins and controls parliament. Europe is moving to the right as the people reject the traditional centrist parties that have governed for seven decades. It’s similar to the 1930’s with a rising nationalism, xenophobia and economic stagnation all contributory factors. Arguably, the same phenomenon is taking place in the United States with Donald Trump. We see it in a number of different countries. In the United Kingdom, a referendum is to take place in a few weeks on the country’s continued membership of the European Union. We should not confuse this with the euro-zone – Britain has an exemption on this issue regardless of the outcome of the vote. The EU itself is the issue in June. The EU has a great deal of support, but many want to put “Britain First,” the name of one of the anti-EU parties on the political right. In hindsight, it was a big mistake for Britain to enter the Union in 1973. But after more than 40 years of marriage, divorce is not going to be easy. In the short-term the outcome may not make much of a difference. The EU is evolving into something more akin to the Holy Roman Empire than the United States, with no two members seemingly alike. Whatever the outcome of the June 23rd vote, the UK will have to come to terms with a German-dominated potential superpower on its doorstep. So will the US. Donald Trump gave a major speech yesterday calling for a radical reappraisal of US foreign policy. He promised to put “America First,” the name of a movement in the 1930’s to keep America out of Europe’s rising conflict. It’s been 25 years since the fall of communism but the US continues to spend billions each year defending long-time allies against Russia, China and North Korea. There is growing resentment amongst American voters who feel that the US has to spend more than its fair share, at a time when Americans are experiencing a fall in their standard of living. There could be significant changes if Trump wins the election in November. At the same time, there could be significant changes in Europe regardless of who wins the US election. Future historians may label this period in time as “the rise of nationalism.” But it’s nothing new. We’ve been there before. The post-World War II international set-up is increasingly falling apart. Within the next few months we could see some real changes. It would be time for another superpower to fill the vacuum. Like our grandfather clock, our grandchildren are likely to see these changes and feel the impact as their world dramatically changes. They will need to remember the words of Jesus Christ to pray fervently for the Kingdom of God (Matthew 6:10).